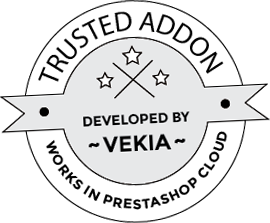 With this addon your customers can track own achievements in your shop. Give them voucher codes - special prices for your products when they achieve new experience badges. Increase your income with this awesome marketing tool. 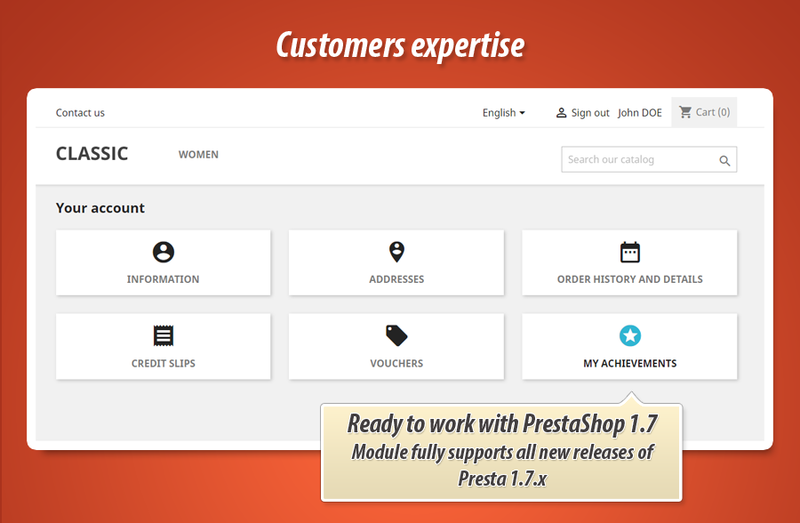 This feature for stores based on Prestashop engine gives you an ability to create "awards" for your customers. 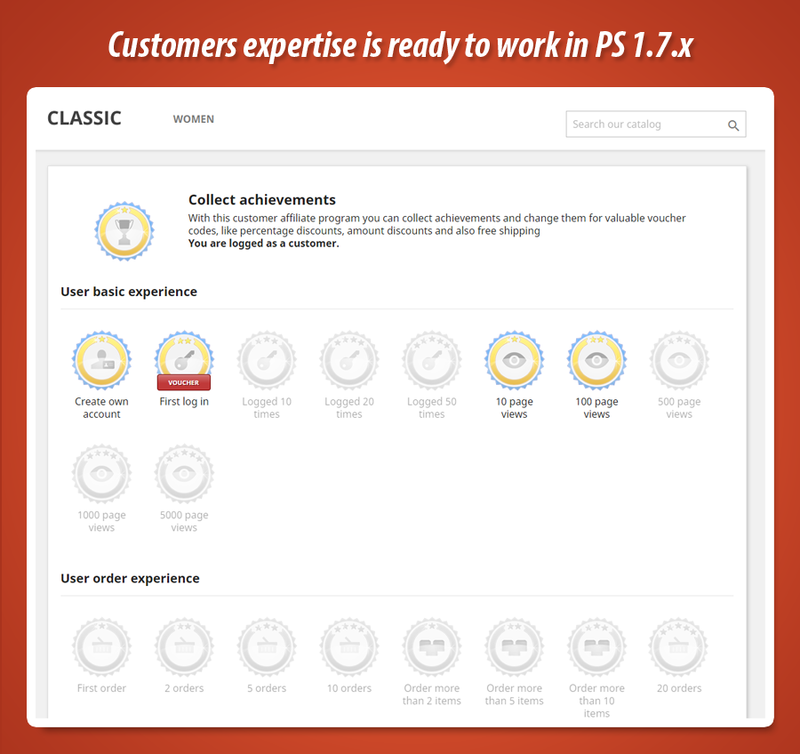 This means that your customers can earn special achievements - badges. These badges are awarded for completing certain tasks, such as registering at a store, creating order, pagie viewing etc. As an administrator of the store you can define for which achievements you will send a discount code. We invite you to read the detailed description of the module. 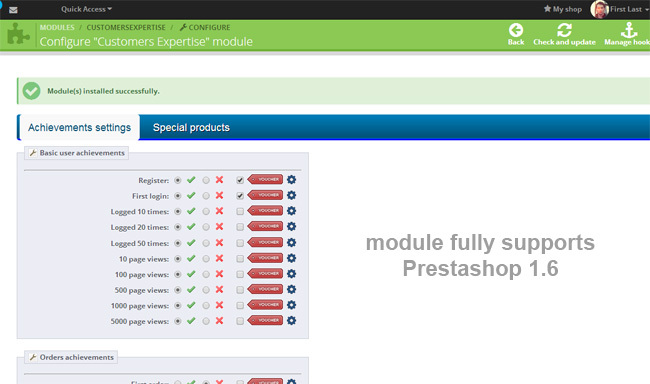 The main and most important feature of this module is an ability to achieve "badges" by your customers. These awards are given for simple tasks such as registration, login, visiting, shopping, pageviewing etc. An undoubted advantage of this awesome marketing tool is the possibility to acquire discount codes. In this way, your customers will be motivated to participate in the program offered by the module. We show allachievements to earn in your shop below. Remember that you can decide which of them will be available, and for which the customer will receive a discount code. In total, there are as many as 40 achievements. After clicking on the button "Voucher", your customer receives a unique discount code. Granted code will work only on his account. Remember that you have the ability to define codes for each achievement. As you can see - this module is an excellent tool for marketing and increasing sales. You have complete freedom of choice, define discount codes only for some of achievements, or for each of them. 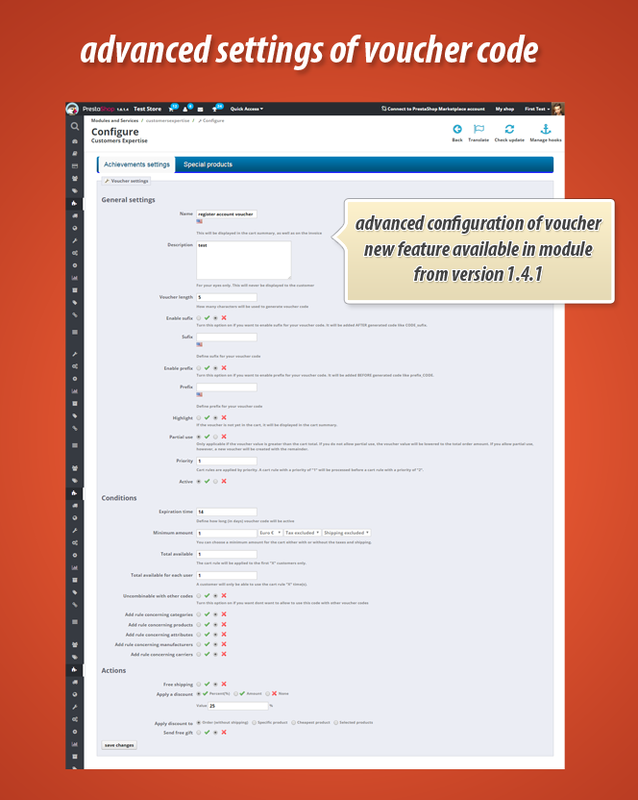 - added advanced voucher configuration tool. Now you can define each aspect of voucher code!